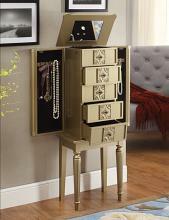 Our online shopping Jewlery armoire category has a wide variety of Jewelry armoires to choose from. Ranging from Oak, Cherry, Walnut, White, Black, off White, most of these are made with wood and we have a few styles made with metal accents . These sets range in size from small , Medium, and large Jewelry armoires for every size room, these can be used in a bedroom or large walk in closet or even in your bathroom with styles ranging from Modern and contemporary to traditional and sleek lined designs. These can accomidate the smallest to largest jewelry collections and has hhok for hanging necklaces and bracelets and drawers for ring and earring storage.